White 32; Coppel SA 32. Linocut in four colors on buff oriental laid tissue. An early impression on the thinner paper, typical of the earliest proofs. Signed, numbered and titled in pencil. 10 1/4 x 13 1/2 in. ; 26.04 x 34.29 cm. A brilliant impression in very fine condition. 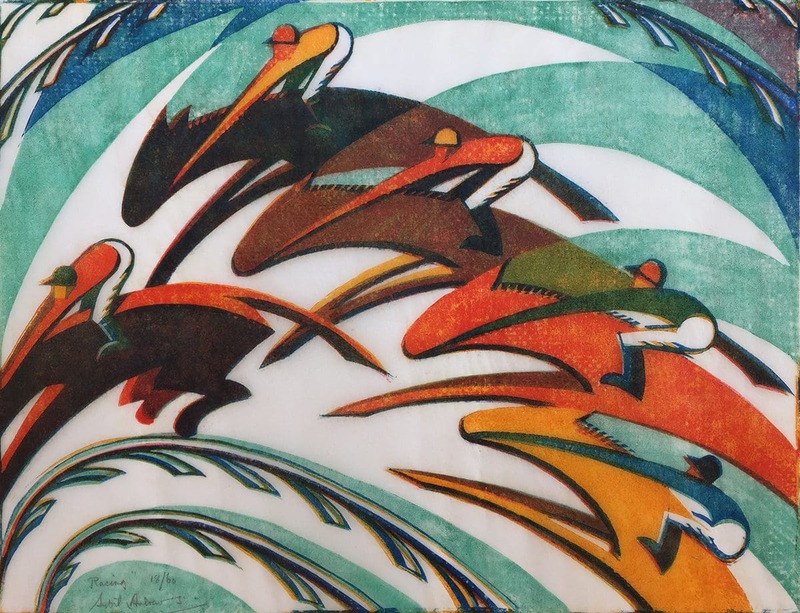 Andrews and other Grosvenor School printmakers were fascinated by the speed and dynamism of modern life and of sports figures. In a rare and early impression with vivid colors, Racing depicts horses coursing around the Epsom Racecourse at Tattenham Corner.